VANCOUVER, British Columbia, Canada, January 24, 2013 (ENS) – Canadian environmental groups today warned that a new proposal by Kinder Morgan pipeline company would “exponentially” raise the risk of a major oil spill in the Salish Sea’s most populous region, including the cities of Vancouver and Victoria. The insurance available to cover response costs and damages of such a spill would fall short, leaving Canadian taxpayers to pay up to 90 percent of these costs, finds a report by the Georgia Strait Alliance, Living Oceans Society, West Coast Environmental Law and the Wilderness Committee. The Salish Sea is the network of coastal waterways between the southwestern tip of the Canadian province of British Columbia, and the northwestern tip of the U.S. state of Washington, including the Strait of Georgia, the Strait of Juan de Fuca, and Puget Sound. The groups’ report follows a January 10 announcement by Kinder Morgan Canada that the company now proposes to enlarge capacity of the Trans Mountain pipeline to 890,000 barrels per day from a previously planned 750,000 bpd. The current Trans Mountain Pipeline runs from Edmonton, Alberta to Burnaby, British Columbia. The company has announced plans to build a C$5.4 billion new pipeline in parallel to it. The new pipeline would bring total capacity to 890,000 barrels per day, mostly crude oil to be shipped to Asia via oil tankers from Burnaby, a suburb of Vancouver located on Burrard Inlet. “Thirteen customers in the Canadian producing and oil marketing business have now signed binding, long-term contracts, which demonstrates the need for this proposed expansion that will serve both existing and new markets,” said Ian Anderson, president of Kinder Morgan Canada. Some of the product planned for the new pipeline is heavy bitumen from the Alberta tar sands. “Ever since they took control of the Transmountain Pipeline and Westridge Terminal in 2005 Kinder Morgan has worked to quietly increase tar sands oil exports through their pipeline and onto to tankers in Vancouver Harbour,” said Wilderness Committee campaigner Ben West last March. Now, between 70-90 Aframax oil tankers a year travel through the Strait of Juan de Fuca, across the Strait of Georgia, into Vancouver harbor and up Burrard Inlet. 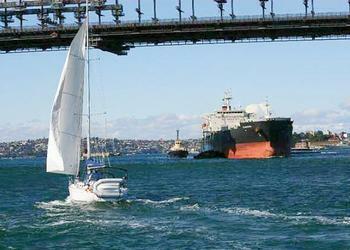 Each oil tanker can carry up to 750,000 barrels of oil. If Kinder Morgan’s plan to build a new pipeline were to be approved, at least 300 oil tankers a year would be plying these waters. 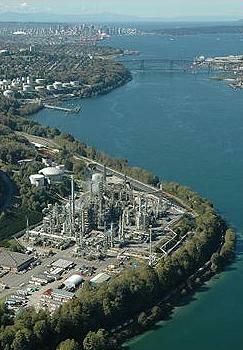 Larger Suezmax tankers are planned, which would require the dredging of Burrard Inlet. “The proposed escalation from 80 tankers per year to 400 or more into Kinder Morgan’s Westridge Terminal in Burnaby, combined with other plans to expand shipping on the south coast, equals a phenomenal increase in the risk of a serious oil spill,” said Brenda Belak, of West Coast Environmental Law. “The risk of oil spills is one of the main reasons that the majority of British Columbians on the Kinder Morgan tanker and pipeline route oppose the project,” said Belak. The groups’ report reviews the insurance structure set up by the International Maritime Organization after the Exxon Valdez disaster, which limits the liability of oil shippers and sets up funds that can be drawn on in the event of a major oil spill. Canada is signatory to all of these agreements. “Taken together, all four of the funds that respond to major oil spills would provide only $1.34 billion, or about one-tenth of the estimated cost of a major spill,” explained Karen Wristen of Living Oceans Society. A study by the Washington State Department of Ecology, conducted in 2004, concluded that a major spill would cost 165,000 jobs and US$10.8 billion in economic impacts in Washington State alone. This does not include individual claims or environmental impacts. A study released last month by the University of British Columbia looked at spills on the Enbridge Northern Gateway tanker route and estimated a major spill would cause C$9 billion in damage to the North Coast economy. The Salish Sea is inhabited by killer whales, at least 200 species of fish, over 1,500 species of invertebrates, 100 species of marine birds, and about 500 species of marine plants. British Columbia’s Fraser River is the largest producer of salmon on the Pacific coast of North America. The region is home to over seven million people who live around the shores of Puget Sound, Georgia Strait and the Strait of Juan de Fuca. The memory of the Exxon Valdez oil spill that devastated Alaska’s Prince William Sound in 1989 informs the groups’ report. The U.S. Coast Guard has estimated that even if the Exxon Valdez been a double-hulled tanker such as the ones that are proposed to serve the Kinder Morgan terminal, it would still have ruptured. The spill might have been reduced by 25 to 40 percent, but it would still have wiped out the herring fishery and devastated the economy of Alaska’s Cordova Bay, the groups point out. Presently, Kinder Morgan is conducting outreach and consultation with land owners, First Nations, businesses, local governments, and other stakeholders. The company hopes to file a formal application to the National Energy Board in late 2013, have construction start in 2016, and be shipping oil by 2017.